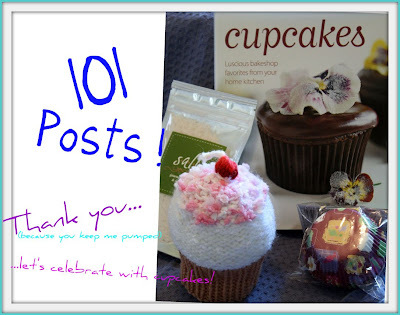 101 Posts- Let's Celebrate with Cupcakes (and a cupcake-ish giveaway)! Yes, I had originally planned to have a giveaway to celebrate my 100th post...but I wanted to squeeze my wine post into June, so I made it 101 instead. It's hard to believe that it has been just under 5 months since I joined the blogging world with My Manhattan Clam Chowder...which is sitting there in all of it's green glory, un-commented on...but still delicious and making me want a big bowl right now! I didn't really know what I was doing. I had just discovered this strange phenomena called a blog. And now that I'm here, it's so hard to believe that there are people out there who don't have a clue what blogging is...it is so addictive...it's a great release...source of creative outlet...and source for meeting great people! So here I am, writing my 101st post here on girlichef and I want to say thank you to everybody who has read, commented, emailed or even mentioned me over this beginning leg of my journey...you rock and are a constant source of motivation and inspiration to me! That being said...let's talk cupcakes!! A few months ago, I was at the library, doing my regular perusal of the newly released cookbooks and I found one called (simply) Cupcakes... Luscious bakeshop favorites from your home kitchen. The author is Shelly Kaldunski (a freelance food stylist and baking and pastry consultant in No. California. As a pastry chef, she baked in restaurants before becoming a food editor at Martha Stewart Living. She was the food stylist for and a contributor to Martha Stewart's baking handbook....or so says the book jacket). I set out to my normal task...reading through the book and marking the pages of the ones I wanted to make. Funny thing, and it happens a lot...I had marked a ridiculous number of pages! Looking at the book from the top, it was hard to separate the pages from the markers. So, instead of photocopying the whole book, I decided I better just order. Heck...why not order 2 copies so that I can give one away? So, I've saved the other copy and had it tucked away until the time came to give it to someone...guess what...NOW IS THAT TIME!! More at the end of the post...now let's look at a few of the cupcakes from this book. Salted Caramel Cupcakes, Tres Leches Cupcakes, Mexican Chocolate Cupcakes...oh my! Now, I'm the kind of gal who likes to show those hardworking folks like Duncan Hines, Betty Crocker and the Pillsbury Dough Boy some love by using those cake mixes and frosting they so painstakingly...make that... lovingly assembled just for our convenience. I'm more of a pie type of gal, but I do like a good cake or cupcake now and again. Every once in a while I will make one from scratch. It was quite the exception for me to make 3 kinds (all in the course of a couple of days) and the frosting all from scratch. It was pretty fun...and they all turned out pretty tasty if I do say so myself. And I do. Whipped Cream frosting is more up my alley...and I'd say most everybody knows how to make it (whip the cream and add some sweetness). This was only the oh, maybe 3rd or 4th time I actually made Butter cream from scratch, so I'll share the recipe from this book with you. 3 large egg white, at room temp. 1 c. unsalted butter, cut into 16 pieces, at room temp. In a large, clean heatproof bowl, combine the egg whites and sugar. Set the bowl over (but not touching) simmering water in a saucepan and heat the mixture, whisking constantly, until the sugar has completely dissolved and the mixture is very warm to the touch (about 160 degrees F on an instant-read thermometer), about 2 minutes. Remove the bowl from the saucepan. 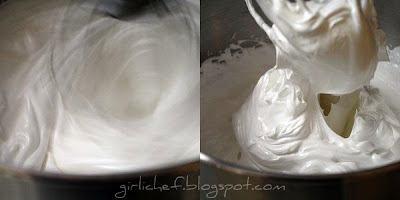 Using an electric mixer on high speed, beat the egg white mixture until it is fluffy, cooled to room temperature, and holds stiff peaks (the mixture should not look dry), about 6 minutes. 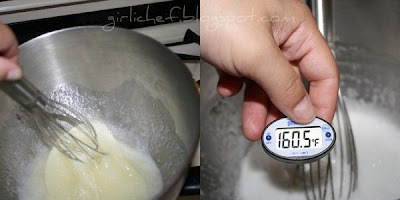 With the mixer on medium-low speed, add the salt and the butter, a few pieces at a time, beating well after each addition. 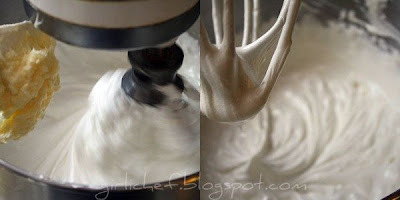 If the frosting appears to separate or is very liquid after all the butter is added, continue to beat on high speed until it is smooth and creamy, 3-5 minutes more. Add the flavorings of choice and beat until combined, scraping down the sides of the bowl as needed. Use right away. (Or make in advance and refrigerate in a airtight container for up to 5 days. Bring to room temp. and beat on medium-low until smooth before using). I chose the Mexican Chocolate Cupcakes because I love Mexican Chocolate, and I just happened to have a few tabs around the kitchen. HOMEMADE Mexican Chocolate that a friend of mines mother brings up from Mexico when she comes to visit. She and her sister actually make it and it is still kind of soft when I get it. I really want to know how to make it one day! 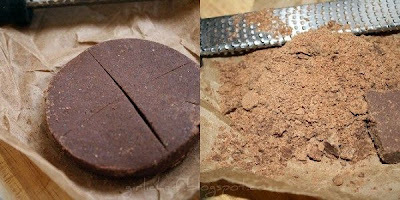 If you've ever bought Mexican Chocolate from the store, you know that the tabs are pretty hard and crumbly and taste best when made into something. Well, not these! I mean yes, they taste great made into something, but I also have a major self-control issue with them...I have to control myself from just eating them as is. They are amazing. 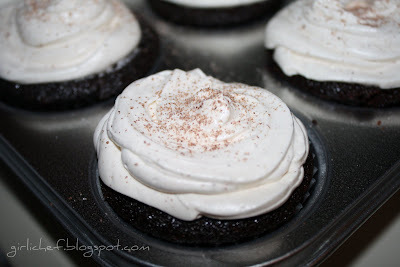 So, some grated Mexican chocolate goes into these cupcakes and is sprinkled over the frosting before serving, also. 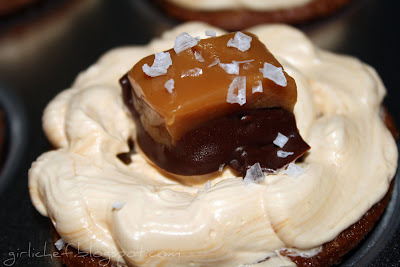 The thing that drew me to the Salted Caramel Cupcakes was...well, the salted caramel garnish! 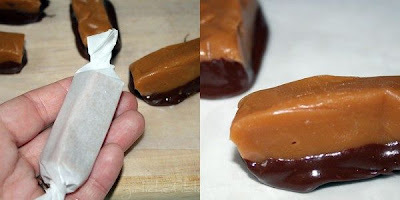 Salt and caramel are such an awesome combo for the salty-sweet lovers out there! My Farmer's Market has a great little shop which has been a firm fixture there since the time it opened (I believe that's what they said) and they make the most delicious, soft caramels! I melted some chocolate and dipped the bottoms, then before serving, cut them in half and placed them on top of the frosting (butter cream w/ cajeta...Mexican Goat's Milk Caramel...swirled in), then sprinkled them with big flakes of Sea Salt. 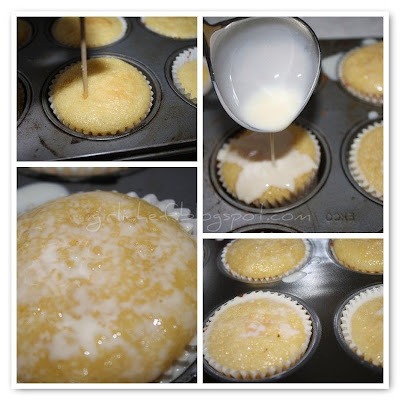 The third type I chose to make were Tres Leches Cupcakes. It's hard for any birthday to pass by in my family without a Tres Leches Cake, and these mini-versions actually turned out to be my favorite of all the types I made. The cake portion is airy and spongy...pricked with holes...then drenched in the "3 Milks" mixture. It's simplicity at its finest...and topped simply with sweetened whipped cream. Ahhhh. And now you say... But girli! I don't have that cookbook and I MUST make those cupcakes! Never fear my friends, this is where my wonderful planning and insight comes into play. To celebrate my 101st post, I'm having a giveaway! Yay...a brand new copy of this book Cupcakes by Shelly Kaldunski could be yours. And that's not all! Two friends of mine have generously donated some fun things to sweeten the pot. First off is the loverly, creative, wacky and silly Lady P of Madly Creative. If you've never read of her crazy, law-evading knit-up adventures, I insist you go over for a good laugh immediately! Once upon a time, I saw her knitting up some cupcakes and knew I must have one for myself...so I did get one for myself AND she threw in one for my giveaway (plus some fun cupcake cards...not pictured)! Another friend of mine, Charmane from SALT has given me a delicious package of Fleur de Sel (Organic French Grey Sea Salt) to add to the fun! If you know me at all, you know I have a slight addiction to all types of sea salts...this one is pure, unadulterated goodness and the one I used in the baking of all of these cupcakes! Plus, I found some cute cupcake liners and decided...why not throw those in, too! Now for the details...I only ask 1 thing of the winner...please bake something from this book after you receive it with a link back to girlichef! That's it. I mean, you were probably going to try at least 1 recipe from the book anyway, right!? 1. For 1 entry into the giveaway: Simply leave me a comment and tell me something, anything about cupcakes. Your favorite kind...one you'd like to try...You love them...You sort of like them...ANYTHING ABOUT CUPCAKES! If you want to say something, but don't want to enter...just let me know you do not want to enter the giveaway (but it's free!!). 2. Mention this giveaway on your blog and link back to this post. Then come back and leave me another comment letting me know you've done this. 3. Tweet about this giveaway with a link back to this post. You guessed it, come back and leave me another comment to let me know. 4. Go visit the SALT website. Come back and tell me which kind of Sea Salt/Fusion Sea Salt you really, really want to try in a separate comment. 5. Go visit Madly Creative then come back and tell me what you'd like Lady P to knit-up for you (hypothetically). Please have all entries in by Midnight on Saturday, July 11 (Eastern time). I will announce the winner on Monday July 13. I think it's safe to say, I'm a much better taste-tester than chef. But that buttercream frosting looks INSANELY good!!!!! Wow! That is one fantastic anniversary give-away and those luscious cupcakes make me want to try them all! I love cupcakes, mostly devil's food with yum chocolate frosting although I'd love to try a S'mores cupcake or that salted caramel cupcake (salted caramels are a local specialty here, too). Off to Twitter about this giev-away, though not sure how to add the link back here. I'm back - am I doing this right? I went to Charmane's Sea Salt site and saw Roasted Garlic Sea Salt! Wow! I'd certainly try that (among others). I cannot believe that I have been blogging longer than you yet you are already such a Queen among food bloggers! Congrats! Last post - Madly Creative is such a cool, fun blog! But, you know, as a foodie I just love the knitted cupcake! Put that on my computer desk and I'm inspired! Good heavens! Happy 100 Girlichef! I simply must have one of those salted caramel cupcakes, they are calling my name.. I think I read this gal's autobiography, Spiced. Very talented lady. Cupcakes. They are so addictive once I get started! Super Yum! Alrighty then - it's Cupcakes time, gals!!! I LOVE that you included your peeps going to my site and "hypothetically" telling you what I should be knitting next! Who knows where that might lead (hehe). MY blog post is up, you are linked and I am LOVING it! Let the Cupcake Contest begin!! First of all, Happy 101st post! Second, I love cupcakes because they are single-serving cakes, they are mini cakes! They are versatile the way regular cakes are versatile! Congratulations on your 100th post! Your blog is so fabulous I'd think you'd been at it for years! You really have a knack for this blogging business and I have gotten some really great ideas and tips from you! Thanks so much! I would love to try the Chipotle Fusion Salt. I would also love to have Lady P make me one of her cozy scarves! I look forward to all of the mouth watering posts to come! Congratulations on your 101st post! And what a fantastic way to celebrate. I do love cupcakes but have to admit that it has to have almost as much frosting as cake. 8-D So this buttercream recipe hits the spot! Here's wishing you hundreds more posts and many years of delicious blogging! 101 posts is a great achievement. I feel this heavily as I head that way myself. What I love about cupcakes. Having an entire cake with frosting to myself of course! I'd really like one or two of your right now though. Hmm...a cupcake with a glass of sweet Riesling would be wonderful for this bloody hot day!! congrats on 101 posts. that tres leches cupcake sounds great. no need to enter me in the drawing, but it sounds like fun. Mmmm, cupcakes. I've never heard of tres leche cupcakes, they looks fantastic! I love cupcakes. :) Cupcakes. Buttercream frosting looks fantastic!! Congrats on your 101 post!! My favorite cupcakes are the carrot cake cupcakes by Ina Garten. What a fantastic giveaway! oh my gosh! Salted caramel is my absolute favorite!! Thanks girlichef! I had tried salted caramel once. OMG...was it good. You can never go wrong with using it on cupcakes. My favs are definitely chocolate. Don't care about the frosting as long as the cake is chocolate. Congrats on post #101 Woohoo!!!!! Happy 101 posts! That is an amazing accomplishment and should be celebrated with many, many cupcakes! ;-) I love your giveaway too--a perfect way to celebrate. These all look terrific! Congratulations on your milestone. Girli..what a wonderful give-away. I adore cupcakes, especially Mexican Chocolate cupcakes. But you know that already. Recently, I purchased the Martha Stewart Cupcake Book and my daughter and I have had a blast going through it. We're ready for another challenge, especially since she's leaving for Dallas to comlete her last two years of university before getting her degree. Congratuations on your 100 (101) post. I love your blog. Have a great holiday weekend. wow 101 - way to go.....nice cupcakes too! These look amazing! Suzi Q cupcakes are my favorites! I'm not real experienced in making cupcakes (or baking) from scratch but I made some really good ones with chocolate ganache in the center and on top and then put those gross looking halloween eyeballs on top for my daughters volleyball team :) Boy were they yummy. what a cool giveaway! I'm IN! I don't like eating cupcakes much, because it's a bit too sweet for me. But I LOVE baking them...It's so fun to create your own tastes, and SO pretty and cute! I lik that salted caramel one, but hmm...I might dream up of a green tea one! Beautiful cupcakes! So I thought you were in our reader, but just found out today that you weren't! So sorry for not commenting on your posts lately! Smore cupcakes...oh man they're good. A hassle to make but so worth it in the end! It would be hard to list a favorite cupcake... I've yet to find one I don't like! These cupcakes are delectable!! You should join Iron Cupcake! I am over here swooning over the salted caramel and the tres leches. Happy 100!! Or 101! I am so happy that you decided to blog and share your delicious creations with us. Here's to another awesome 100! I'd love for Lady P to knit me an apron!! I love these s'mores cupcakes that we buy at a cupcake shop at the mall but I'd give an arm for that salted caramel cupcake!!! Congratulations on your 101 post! Wow, time flies fast! These scrumptious cupcakes are a wonderful way to celebrate! Happy 101!! I love that you go to the library and search the cookbooks. I always feel funny when I pick out about 12 cookbooks and waddle to the desk - LOL!! Do you ever wonder what the librarians think : ) I love all those cupcakes you made. They sounds so unique. I saw a recipe for a lemon meringue cupcake and was interested in making that. I'm planning on ordering some salt soon. I think the merlot or the wine salt and the jalapeno fusion. Congrats! You amaze me. I can't believe you've only been blogging for 5 months!! Seems like you're just so natural at this that surely you've been doing it from the very beginning. Those cupcakes are all just beautiful and oh my gosh, that caramel is callin' my name!! As far as cupcakes, LOVE 'EM! I like the fact that they're like mini-cakes but with built in portion control! I freeze them and then I can pop one out whenever I have a hankerin' for cake. But I couldn't let this post go by without saying how much I enjoy visiting with you here. You have a terrific blog and some delicious recipes. I've been looking for an outstanding cupcake recipe lately so this one looks terrific to me. I love cupcakes because they have built-in portion control. Without that, I'm a goner. I'm off to do all the other things you requested! I've been craving a good frosting loaded cupcake all week, seriously!! Did you even have to ask?! The habanero, of course! HAHA Just kidding. I have a three-way tie of favs: Lime Fresco (LOVE LIME! ), Vintage Merlot (not only does this sound scrumptious, but it looks pretty too! ), and the White Truffle (make fun of me all you want, but I've never owned anything with REAL truffle in it and the thought alone fills me with glee). Congratulations on 101 posts! The salted caramel cupcake sounds incredible. Congrats! !I'm inching towards my 100th post too-very slowly though!! Lovely cupcakes-I'm not a big baker,so me not entering the giveaway ;) I'd rather see it go to someone who really deserves it. My mom made me tres leched cake for my biorthday the other day- but I've never had cupcakes- delish! Congratulations on your 100th post. What a nice anniversary give-away. Lovely cupcakes too. ummm these sound great! Congrats on the post...I forgot to do it until way after! Your sandwich at warm olives looks awesome. I love a good gooey chocolate cupcake. Also congratulations on reaching the 101 mark. The cupcakes you make look amazing!!! oops I did not post an email in my earlier post. I just went and checked out the "SALT" website and I sooooo want to try the salt and vinegar fusion mix. I can just imagine how great that would be on hot out of the fryer french fries....yum! I would love for Lady P to knit me some winter gloves. I have oddly short fingers and can never find gloves that fit my normal size hand but child size fingers...lol. Sweet and Salty is always good. Love to sneak a peak at some of these cupcakes if I should be the lucky winner. Good thing the 7-11 carries sugar. Congratulations on your 101st. You have been a busy girl. And those cubcakes look so professional. I love all the flavor combinations that cupcakes lend themselves to. Congratulations on 101 posts!! Your blog looks great. I came on here from burpandslurp.com! 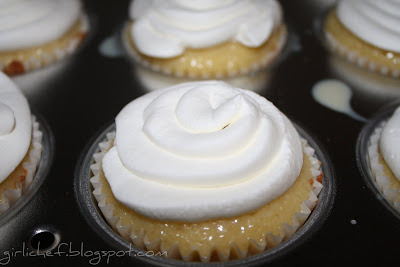 I'd love to make those tres leches cupcakes, they look great, and soo much better than a simple cake!! The cupcake hat for adults on madly creative's store looks great!! I wish I had one of that sort!! #3. I hope I'm doing this right! The salt website is great! I lovve all the information given!! And boy,, there are a lott of salts on there!! I've got a huge stock of Indian Kala Namak, but haven't tasted any other kind, except for Himalayan! I'd love to try Fleur de Sel, since its soo recommended by people for topping cookies etc. I love cupcakes, but I think it's because I love cake. And lately I have been craving dark chocolate (devils food) cake with a lighter frosting, maybe something white chocolatey, but caramel additions are always nice too. Then again, maybe a swirled white chocolate-dark chocolate buttercream top would be divine!! I really want to try the Indian Black Salt and the Peruvian Pink Mountain Salt! Sounds great!! Great giveaway!! Hope your week is going well!! Okay, here's my #1 comment to enter the give away. I make two cupcakes that always get rave reviews. The first is rootbeer with a lucious whipped cream frosting. And the second is a wicked heart of darkness that will cast its spell over you. I followed your instructions to qualify for the second entry. It's me again, Moogie. I want Lady P to knit me a Zombie Cupcake. It's Moogie again saying that I would really love some of the smoked sea salt. I bought the book Hello, Cupcake and love looking at the creativity. Haven't made any of those yet...but I will. So cute! I'd love a knitted pair of winter gloves. I'd love to try the smoked sea salt.